(Inside Science) -- Raccoon dogs are having trouble finding a private moment to take care of their bathroom business in Tokyo’s Akasaka Imperial Grounds. According to new research, human disturbance of the animals’ bathroom breaks may be impacting their social lives. “Changes in frequency of defecation and latrine-use might have negative effects on their scent communication behavior,” said Masumi Hisano, a graduate student in biology at Lakehead University in Canada, in an email. Hisano is an author of a study published recently in The Journal of Wildlife Management. In Japanese folklore, the raccoon dog, or tanuki, often takes on a shape-shifting trickster persona. 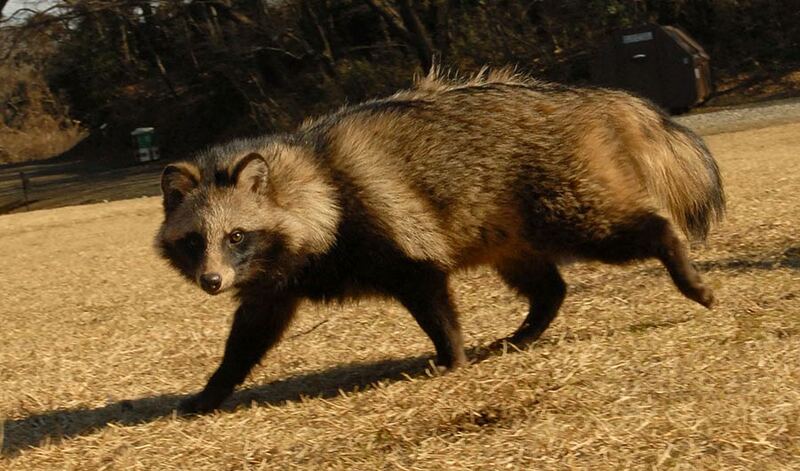 Despite their name and banditlike appearance, raccoon dogs are neither raccoons nor dogs. They are more closely related to foxes. The Japanese variety is a subspecies smaller than other raccoon dogs that live elsewhere in East Asia. Though they were once extirpated from the urban Tokyo area, they eventually adapted to city life and began moving back in over the past few decades. They make their breeding nests in tree hollows or dry drainage pipes and sleep in places like leaf piles and bushes. They eat anything from bugs to small mammals, amphibians, reptiles and, like North American raccoons, garbage. But despite these humble beginnings, raccoon dogs have moved into the Akasaka Imperial Grounds, which house the crown prince’s residence. Even Emperor Akihito conducted research on the diet of the raccoon dogs living in the separate grounds of the main Tokyo Imperial Palace. One way the mammals communicate is by the habitual use of latrines, which are often just piles of feces in the middle of a clearing or even in an open area. They may use several of these throughout their range, sometimes sharing them with other individuals. Researchers believed that humans may be disturbing this natural form of communication among the animals, but they didn't know much about the details. They put motion-activated cameras at latrines around the Akasaka Imperial Grounds, analyzing some 3,257 bathroom breaks and 878 “defecation events” between 2012 and 2014. They found that though many latrines are out in the open, raccoon dogs tended to use them more at night when humans were less likely to disturb them. Hisano and her coauthor Yayoi Kaneko, a biologist at the Tokyo University of Agriculture and Technology, are uncertain whether this means the creatures hold their waste in or seek out other more secluded, unmonitored bathrooms when disturbed. They did find that though the patterns changed due to disturbance, the overall number of visits to the particular latrines they were monitoring didn’t change. Petteri Nieminen, a biologist at the University of Eastern Finland who was not involved in this research but has also studied raccoon dogs, said the work complements research done on the introduced populations of the species in Europe. “The researchers have performed a methodologically solid study showing how the raccoon dogs respond to disturbance by humans in these conditions,” he said in an email. While the health consequences of disturbed bathroom behavior are uncertain, the researchers believe that these changes may affect the communication of things like territory and sexual availability between the animals. The researchers said the large latrines smell really bad to humans. They are sometimes removed from parts of Tokyo because of the stench and for sanitary reasons. Raccoon dogs' feces can contain parasites and diseases transmissible to humans or their pets. During the study period, the researchers confirmed that the animals were breeding in the Akasaka Imperial Grounds, and noted that humans should avoid disturbing these latrines around breeding periods, especially around sunset and in the winter months. Hisano and another of her coauthors, Masayuki Saito, also from the Tokyo University of Agriculture and Technology, speculated in an email that raccoon dogs may live an easier life in the Akasaka Imperial Grounds than in other parts of the city due to less human disturbance. According to Takeo Kuriyama, an environmental scientist at the University of Hyogoin Japan, who was not involved in this research, the animals also face a threat from invasive raccoons, which share the same ecological niche. Raccoons have been expanding throughout Japan since being introduced in large numbers several decades ago -- possibly due to the popularity of a children’s cartoon featuring a raccoon. It is "imperative to monitor the population trends of native raccoon dogs to conserve this species,” said Kuriyama in an email. Raccoon dogs’ shift to more nocturnal bathroom habits is likely an adaptation which helps them live so closely with humans. In some parts of Europe where raccoon dogs are invasive, this shift may be part of the reason for its success in new environments. “The raccoon dogs need not acquire totally novel modes of behavior but by shifting existing patterns into an even more nocturnal direction, the animals have colonized European regions very successfully,” said Nieminen.